I have been looking forward to Crimson Peak for quite some time. The very notion of Guillermo del Toro crafting his own original old school Gothic haunted house horror film had me absolutely giddy, and even just the first batch of still promotional images released made me melt at the delicious visuals. Tom Hiddleston, Mia Wasikowska and Jessica Chastain. This was guaranteed to be special cinema. Turns out it was a shaky, kinda sorta, I guess so guarantee. Those delicious visuals? Scrumptious. Sumptuous. Remarkable. Crimson Peak is an absolutely sublime experience for the rods and cones, with award worthy production and costume design filling every frame. If I were merely critiquing the movie for style points, it would be a surefire masterpiece. The problem is the story. It's not that it is poorly written or performed, it's just that it felt familiar and stale, like a film I had seen numerous times before only rehashed in 2015 with a spectacular aesthetic to modernize it. 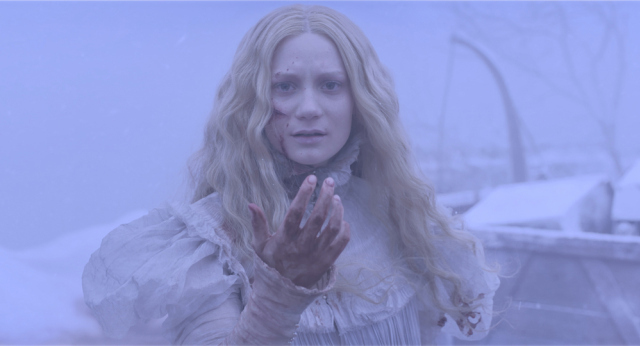 The picture takes place in 1887 and revolves around a young lady named Edith Cushing (Mia Wasikowska), who as a child is visited by the ghost of her mother who delivers a strange and ominous warning: "Beware of Crimson Peak." A number of years later Edith meets a man named Thomas (Tom Hiddleston) who has come to the United States from England in search of investors for a new clay-mining invention he has designed, and he has his eye on the money of Edith's father, Carter Cushing. Problem is, Carter isn't interested in investing, and things become even more heated when he finds out Thomas has become romantically involved with his daughter. Safe to say the timing is interesting, then, when a short time later Carter Cushing is found dead. 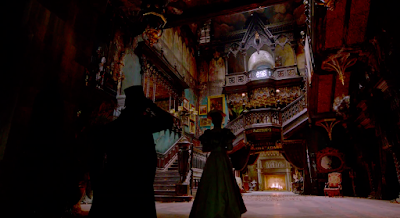 Without her father in the way anymore, Edith and Thomas marry and return to his home in England, a creepy yet beautiful mansion that also goes by the name of, you guessed it, Crimson Peak. There they live with his cold and off-putting sister Lucille (Jessica Chastain), but it becomes clear to Edith that the three of them aren't alone inside those walls. A part of me wonders if I am being too harsh on del Toro due to my predetermined expectations on this being an original film, and the key word there is original. For months I had assumed I would be lost in wonder not only because of the technical craftsmanship but also on a narrative level, and frankly the actual events taking place on the screen did little to conjure up excitement. Still though, had this been an older film I would be lavishing it with praise over the atmosphere and the lighting and the set designs and the performances and I probably wouldn't have given the familiarity concerns of the story a second glance. I sat watching Crimson Peak unfold and I couldn't help but think of del Toro's masterpiece Pan's Labyrinth, a film that while inspired by Victor Erice's The Spirit of the Beehive still managed to ooze a unique and awe inspiring vibe from the first frame to the last. 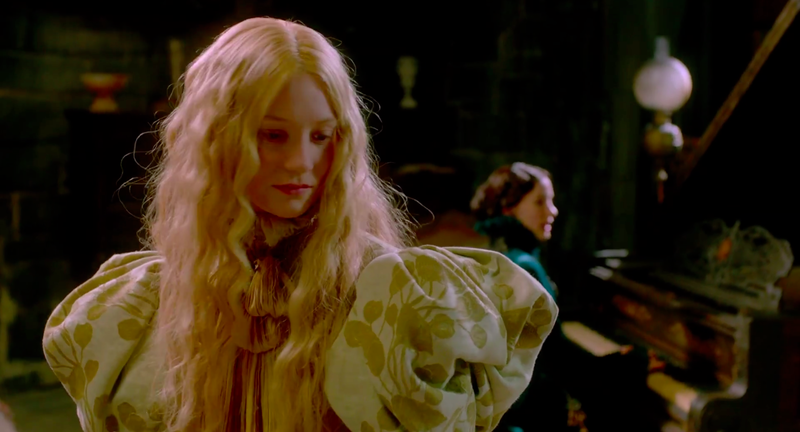 It was like nothing I had ever seen before, and perhaps I unfairly held Crimson Peak to that lofty standard. Still, I feel the way I feel and no matter how much I try to talk myself out of it, my gut isn't budging on this one. Crimson Peak is part masterpiece and part underwhelming, a film that I will gladly revisit just to be able to live inside the mansion again, see the gorgeous snow falling from the ceiling one more time. I'm simultaneously thrilled and disappointed, as strange as that sounds. My gut is also telling me this is a definite candidate to be enormously more enjoyable with a revisit. Sometimes all you need is to refocus expectations and understand what a director was going for all along and see the work through a different lens, perhaps dig a little deeper for some of that thematic richness I just know is hiding in there somewhere, underneath Crimson Peak. We are on the same page entirely here Cody, minus the most anticipated portion. Not that I have a problem with In the Heart of the Sea, I look forward to that as well, but The Force Awakens has been my most anticipated since two minutes after they first announced it haha. You absolutely nailed this review; I totally agree. The mansion and visuals - beautiful. Actors - except Jessica, perhaps - spot on. I mean, Mia and Tom have the chemistry; one thing's missing, however, is portraying it. He's supposed to fall in love with her in the end - there are maybe two or three scenes that show the process. Too little, too late. And the story seems tired, you're right. I'd like to get into characters' heads more. I was waiting for the movie biting my nails; that stopped while I was watching it, unfortunately. But then I'll watch it again, with pleasure, for its images - beautiful movie with somewhat disappointing content. Ah we are absolutely on the same page here Monika and I really like your point about the falling in love progression to be weak. Definitely didn't flesh that out enough in order for the audience to believe in it. Thank you so much for your thoughts, really appreciate it!